I feel really blessed to be an active member of such a wonderful and supportive community as is Artists Without Walls. One of my favorite things about AWoW is the diversity of its members. During one evening you may witness an actor, poet, dancer and musician, from all possible genres, classical or jazz, to edged rockers and original singer/songwriters. Of course, with AWoW being a New York City based community, just about everyone comes from another place. (I’m from Prague, Czech Republic.) Different backgrounds and ethnicities mix in one room in a very positive and sharing atmosphere. What a great opportunity to create new connections and collaborations! On top of that, there are no age restrictions, and this all adds up to the colorfulness of an AWoW event. 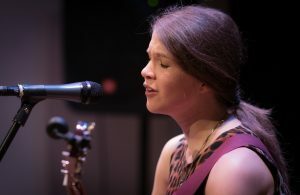 AWoW has featured me at three of its showcases, which take place at the Cell Theatre, located in Chelsea. Every performance at The Cell has helped me greatly. I’ve obtained new fans; have been able to promote my music and upcoming shows, and recently, my brand new CD. Aside from the regular monthly showcases, AWoW organizes themed events, exhibition openings and presents their artists at venues around the Big Apple. Thank you, AWoW for helping to keep your members busy. Martina Fišerová is a singer, songwriter and lyricist. She accompanies herself on guitar and piano in solo shows and performs with a full band as well. She has collaborated with Impuls, Laco Deczi & his Celula New York, Phishbacher Trio, Jan Kořínek & Groove, Rajnošek Band and many others and supported the Czech rock star singer Kamil Střihavka as his backing vocalist for several years while leading her own original acoustic band Seven Days. At the present time Martina is exploring the New York City scene and has just recently released her new album of original music entitled SHIFT.